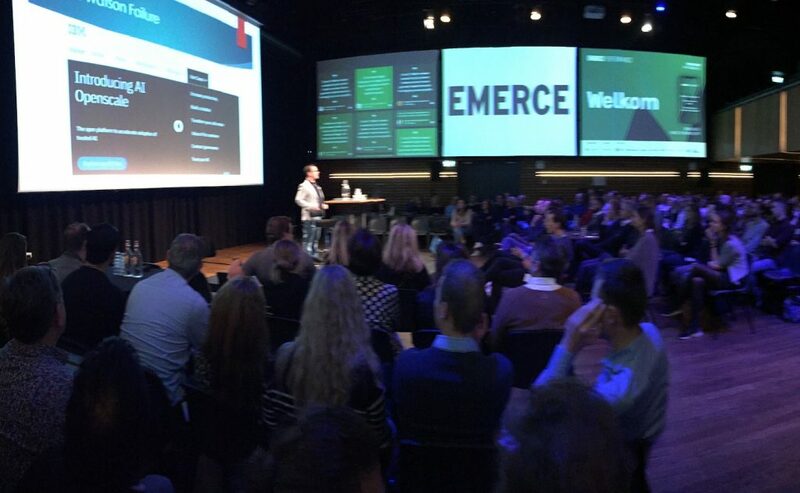 Today, I gave a keynote at Emerce Performance on blockchain and the potential return to creativity in online advertising. The deck is here. The prepared transcript is below. Hello, hello, everyone. I hope you are enjoying Emerce Performance so far, and a special thanks to the organizers for bringing all of us here today. For full disclosure, I am excited to be in Amsterdam for the first time for one simple reason: I am absolutely addicted to stroopwafels. Seriously, I’m going to go and stuff my suitcase with them right after this talk. But before I do that, I’m here first to speak about creativity and blockchain in marketing. I opened this talk with that famous South Park scene because I might never again have a chance to talk at a conference about “Number Two.” Yes, every joke is funny for a reason — and you will see why in this talk. But first, a story. In 2006, a company created a breakthrough AI that can answer human questions. In 2011, the technology won the first-place prize of $1 million on the US game show Jeopardy. Two years later, the company said that the AI would revolutionize cancer diagnosis and treatment. That technology, of course, was IBM’s Watson. If you visit IBM’s Watson website today, you will see that it talks about chatbots and call centers. That is a long way from curing cancer. Remember that anytime that some marketer is hyping some new technology. Let’s look at the greater context. Cryptocurrencies are beginning to smell a lot like the tulips that caused a financial bubble right here many centuries ago. And still no one I know in the world personally has a virtual reality headset. And everyone continuously waits for the flying cars that we were promised in early science fiction. High-tech fads come and go, and the best inventions never arrive at all. But blockchain is one innovation that could have potential today. First, a short introduction. In my prior career, I was first a journalist and newspaper editor who later moved into marketing. Most recently, I was director of marketing at a tech company. Today, I write a biweekly column on marketing and media for The Drum and travel around the world to speak about what I report. I use my dual experiences to discuss the marketing industry with the mindset of a neutral journalist. I have no assumptions. I take nothing at face value. I have nothing to sell except my ideas. And I do not accept any fad without evidence. And, yes, blockchain might be a fad. People talk about it ending human trafficking and climate change, helping election reform and promoting inclusivity in journalism, and reducing drug and alcohol abuse while also killing cable TV and Netflix. And there is one blockchain company that is quite literally bananas. Just as the ad tech industry has a landscape, so now does blockchain in marketing. But is it legitimate? The issue might not be so much that blockchain doesn’t add value, it’s that the martech space has not had a demonstrated success with it yet. Everything is hypothetical. Blockchain is a solution in search of a problem. Many buzzwords and supposed advances in martech are simply one of two things: either a new type of direct response that targets people with some type of electronic junk mail or an AI technology that does low-level sales or customer service. Blockchain, on the other hand, could be a real advancement. Blockchain is different because it could lead to a fundamental restructuring of the way that marketing operations — or anything else — can occur online. Please note that I am repeating the word “could” for a reason. But for a second, forget all that. First, here is what blockchain is. Blockchain is simply a digital ledger in the cloud. That’s all. It is what accountants have always used. Blockchain is the technology on which cryptocurrencies such as Bitcoin are based. It is a decentralised and shared digital ledger with a continuously updated list of transactions across a fully distributed or peer-to-peer network. Yes, that is techno-babble. In basic terms, Blockchain is like a gigantic Google spreadsheet in the cloud. Whenever someone in the network makes a transaction and “edits” the ledger, everyone else verifies the change and then sees the updated ledger. No other party — such as a government, bank, or financial institution — is needed. A blockchain can be public or private as well as have its own currency or medium of exchange — which is why every blockchain project seems to have an ICO (or, “initial coin offering”). John and Jennifer are members of a specific 10-person blockchain network. John pays Jennifer $1,000 for some given transaction. John and Jennifer update their ledgers to show that Bob loses $1,000 and Jennifer gains $1,000. Everyone else on the network verifies the transaction, and then the ledger updates. Each finalized transaction is a ‘block” within the sequential “chain” of the ledger in a similar way to an accountant going down through each line in a company’s books. Once a block is finalized, it cannot be changed. Now, just imagine the same example — but the networks consist of 500 or 5 million people. That is blockchain. Supposedly, blockchain can create $122 billion in value by 2030. Every marketing trade publication, like The Drum, covers blockchain all the time because there is something unique about the technology. If someone wants to advertise through Google or Facebook, that person must work within a centralised platform that is owned and dictated by those companies. But if a group of people want to buy, sell, or trade something among themselves — whether it is Bitcoin or something else such as marketing leads — then blockchain technology could help to facilitate that. First, the AdChain Registry here provides advertisers with a list of websites that offer high-quality inventory for serving digital ads. Here are some other prominent blockchain companies in the marketing world. Everyone here could perhaps use them or think of them as inspiration for future projects. AdEX is a decentralized ad network based on blockchain and smart contracts technology. Basic Attention Token is a token that can be exchanged between publishers, advertisers, and users on the blockchain. Bitclave is a decentralized search engine powered by blockchain that compensates users rather than advertisers. Indahash is an influencer tech platform that launched a cryptocurrency last year with which brands can pay influencers. Lucidity is an advertising protocol for data transparency. MadHive is a decentralized ad network built on blockchain and a platform for data exchange and collaboration. LeadCoin is a blockchain network that allows companies to sell unused leads to others. Personally, I like this one. If someone here has a qualified lead that went nowhere but might interest another company, you can sell it to them. Mavin is a microinfluencer network that will launch its own blockchain coin. MetaX is a company that builds blockchain-based protocols and decentralized applications for digital advertisers and publishers. Papyrus is a decentralized online advertising ecosystem that uses blockchain and aims to improve the programmatic advertising industry. Provenance uses blockchain to help producers, suppliers, and retailers to track and monitor supply chains. Truth is a media agency built on blockchain technology and run by The Marketing Group that promises advertisers full transparency. Now, focus on that word — “transparency.” That is the reason why blockchain could lead to a return of creative advertising in the digital marketing world. But first, a little background for those in the audience who might be students or people just starting their careers. Two of the marcom tactics in the promotion mix are advertising and direct response. Advertising builds brands and aims to reach people who will buy tomorrow. Direct response focuses on precise targeting and getting sales or leads today. Both are important. But over the past 20 years, digital marketing has gone all-in on direct marketing. The channels have changed but the practices remain. We had direct mail; now, we have e-mail marketing. We had infomercials; now, we have online videos that want us to click. We had advertorials; now, we have blog spam or “content marketing.” We had fliers that would appear on walls and posts; now, we have pop-up ads. Today, we have direct response ads that interrupt our conversations with friends and family on social media as well as others that follow us around the Internet. Now, direct marketers love the tactic because it is completely trackable whereas creative advertising is not. Direct response is the only tactic where you know where every single euro is going and exactly how many euros you sold in response. But consumers hate it also because it is trackable — and that is one reason that I predict a return of creative advertising. In this MarketingSherpa survey, online direct marketing of all types is the type of marcom that people like the least. Now, the web existed for two decades without people desperately trying to find a way to block online advertising. So, why is it happening today? Linux Journal editor Doc Searls found the answer: Direct marketing run amok and taken to an extreme. Searls used Google Trends data to show in the Harvard Business Review that the rise of ad blocking has specifically correlated with the appearance of retargeted advertising. Retargeting was the straw the broke the web’s back. People hate it. Retargeting has turned the marketing industry into drug addicts on the path to suicide. We like the constant highs of the purchases and conversions, but all of those hits are eventually going to kill us once consumers have had enough and block ads altogether. People do not want to be tracked. The more that marketing tracks people, the more that it will annoy people. After all, the number of devices using ad blockers is only continuing to increase. According to a PageFair Adblock Report, 20% and 18% of people in western Europe and North America are now using ad blockers and script blockers — thereby rendering online direct response useless. Strategists and media planners have always known that every marcom tactic and every marcom channel has positives and negatives. Direct marketing online has annoyed people to the point where they are increasingly blocking it all. And that is the first reason why I predict that we will see less direct response and more creative advertising online in the future. But don’t worry — doing so will only increase effectiveness. In the UK, the IPA found that the best tactical spend is to devote 60% to creative advertising and 40% to direct response. And doing that results in the most sales over the long-term. So, let’s summarize. Many digital marketers prefer direct marketing to advertising because it is directly trackable. But consumers are tuning it out. So, what should we do? That is where blockchain could come into play. Now, the problem with advertising in the ad tech and programmatic worlds is that we have no idea where our money is going. Besides the annoyance factor, the other reason that we will see a return from direct response to creative advertising is ad fraud. This year, ad fraud may cost advertisers $19 billion. And that amount will only increase because ad fraud is both easy and profitable. In addition to advertising being untrackable, ad fraud is another reason that many digital marketers do direct response and not creative advertising. Here is the best example I have seen. The Guardian in the UK bought its own inventory as a test and saw that they got only 30% of the money that they paid. 70% of the spend went who-knows-where. So, where did the money actually go? Sketchy middlemen. Between the time that you place an order and the ad appears on a website, 75% of the spend is lost after you pay your agency of record, trading desk, demand-side platform, targeting and verification services, and ad exchange. And this is where blockchain could come in. A cloud-based digital ledger that lists every single transaction line by line could finally let digital advertisers see where their money is going. At the same time that consumers are blocking online direct response, blockchain is potentially bringing transparency to digital advertising. And that is why I think blockchain could lead to a return to creativity in online advertising over direct response. But — there are many buts. This is where my skepticism comes in. While blockchain could finally bring transparency to creative advertising, there are significant issues. First, the transaction speed is very slow — perhaps because every single person in a blockchain must review and approve every transaction. When I last researched the issue, a blockchain could process only up to 15 transactions per second. For comparison, Visa processes thousands per second. Second, security is an issue. Nothing on the internet or in the cloud — which is just a buzzword for using someone else’s servers — is impenetrable. Everything can be hacked. Many cryptocurrencies — which are all built on blockchain — have failed due to hacks and denial of service attacks that resulted in the theft of the cryptocurrency. Third, blockchain consumes an enormous amount of energy. Marty McFly needed 1.21 gigawatts to travel back in time. Bitcoin — again, which is built on blockchain — is projected to use 7.7 gigawatts by the end of this year. That is the same as half a percent of the world’s entire energy consumption. And that is just one blockchain. So, in light of the concerns of energy use and climate change, I must ask: is blockchain really good for the world? Fourth, Australia’s Digital Transformation Agency spent $700,000 to investigate the potential use of blockchain. Their conclusion? “For every use of blockchain that you would consider today, there is a better technology.” Crikey. In my research, most critics of blockchain state that companies could simply use in-house databases as they have always done for any supposed blockchain use case. In terms of blockchain, we are still at, yes, Number Two. No one knows what will happen. There are many potential uses in marketing, but there are many structural problems. But if anyone can create a blockchain not for bananas but for stroopwafels, I will certainly be impressed. Everyone, thank you for your time. I will send this presentation to all of you. As you might see, I love writing and speaking about marketing. If any of your companies might like an appearance, I would love to return to Amsterdam. Thank you.